For basements that have inherent moisture problems, homeowners may wish to consider using mold-resistant furniture/all-weather furniture. This type of furniture is typically used outdoors and can range from cheap to quite expensive. Whatever amount you choose to invest in showcasing your newly refinished basement, you surely do not want items to sustain water damage ranging from water vapor penetration to flooding. Basement furniture needs to consider the increased moisture contebnt of most basements and incorporate materials that are mold and water resistant. Surprisingly, even though all-weather furniture is made for the outdoors, there are options available that resemble indoor furniture styles. The types of furniture begins from the lawn/patio variety and graduates to sofas, sectionals, love seats, easy chairs, ottomans, tables, chests, and corner units. Comfort is kept in mind also with high-end modular and deep-seating style options. Materials are used that naturally resist mold in the engineering of all-weather furniture. Wicker, rattan, imitation wicker, imitation rattan, teak wood, cast aluminum, and bamboo are all widely used as components for their natural mold-resistance. The consumer can choose between painted and unpainted models that are both 100% weather and UV resistant. Mold-resistant nylon is used for the upholstery. The 100% solution dye used for the acrylic fabric can be matched to any decorative surroundings. One word of caution is that you should check different manufacturers because this convenience comes at a higher cost after moving beyond the lawn/patio styles of furniture. You have to decide if the money is worth the investment. The framing is strong and aesthetically-pleasing. Another benefit about the all-weather furniture is that it is easy to keep clean and maintain. It is very durable in both the upholstery and framing. For best results, hosing down the furniture and allowing it to dry outdoors is the recommended way to clean it. Only the homeowner can determine if investing in this type of furniture would work for them. 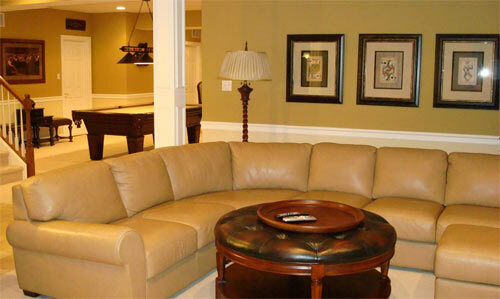 After taking the time to finish the basement, it could be worth the cost and effort to locate the desired style. Whatever style is chosen, the homeowner can be assured that the furniture will last for decades with very little chance of damage from water vapor penetration and flooding. Tip #107. Does foundation shifting negatively affect resale value? Absolutely! Structural damage results from damage to any building component encompassed within the crawl space. Once weight-bearing components are affected by moisture, they can shift. The problem is that most foundation damage is not apparent until the damage appears elsewhere in the home. Homeowners should become familiar with warning signs.